Environmental & Atmospheric | PLX Inc.
Robotic exploration of Mars atmosphere uses TIRVIM Fourier-Spectrometer with PLX Retroreflectors. The TIRVIM (Thermal Infra-Red V-Shape Interferometer Mounting) Spectrometer is part of the Atmospheric Chemistry Suite (ACS), launched in March 2016 and is now successfully operating in orbit around Mars. The PLX Retroreflectors used in the TIRVIM Interferometer offers properties which enable it to survive launch conditions and to perform in harsh environments while maintaining exceptional stability and accuracy. Beryllium assemblies for the Thermal Emission Spectrometer (TES) built by Jet Propulsion Laboratory for NASA. TES was a high-resolution infrared imaging FTIR spectrometer designed to measure the state of the Earth’s troposphere. It successfully launched into polar orbit aboard NASA’s Earth Science Enterprise EOS-CHEM spacecraft in December 2002. Other PLX-designed instruments chosen for TES included back-to-back Hollow Retroreflector™ assemblies, Hollow Roof Mirror™ assemblies and various folding mirrors, all made of beryllium. With accuracies that were better than 1 arc second maximum deviation and λ/20 surface flatness (λ=633nm), these instruments operated without distortion at cryogenic temperatures down to –100°C after surviving launch vibration conditions. ACE-FTS Atmospheric Chemistry Experiment Fourier Transform Spectrometer. 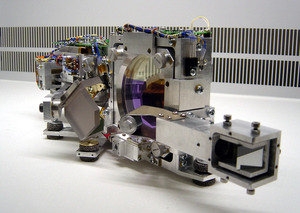 The spectrometer Built by ABB Bomem in conjunction with the Canadian Space Agency and was launched in August 2003 aboard SCISAT-1.The major goal of this experiment was to measure and understand the chemical processes that control the distribution of ozone in the Earth’s atmosphere. The ACE-FTS instrument simultaneously measures the temperature, trace gasses, thin clouds and aerosols in the atmosphere. The PLX retroreflectors provide modulation in the ACE-FTS, which is a Michelson interferometer. The PFS is an instrument developed by the European Space Agency (ESA) to study the atmosphere and soil of Mars. The main optical units of the PFS are not Michelson Interferometers, but rotating interferometers containing the PLX retroreflectors. This instrument is much less sensitive to mechanical disturbances than conventional Michelson interferometers. This is a space application where the retros will undergo sinusoidal modulation in the range of 10-100 Hz. These retroreflectors are part of a device intended for remote June 2003 as part of the Mars Express. The main objective of the Mars Express is to search for sub-surface water from orbit and to drop a lander on the Martian surface. Another PFS was launched by ESA in November 2005 aboard the Venus Express. The goal of this program is to perform a global investigation of the Venusian atmosphere. Retroreflector In Space (RIS) for NASDA, the Japanese Space Agency. PLX designed and manufactured the 50cm (20”) diameter Retroreflector In Space (RIS) for NASDA, the Japanese Space Agency. The largest Retroreflector ever sent into space, RIS was launched on the ADEOS satellite in July 1997. RIS achieved 1 second of arc accuracy and contained a curved mirror to compensate for the movement of the satellite through space. RIS was a Retroreflector for an earth-satellite-earth laser used in long-path absorption experiments. RIS has a corner-cube structure with an effective diameter of 50 cm. Measurements of ozone, CFC12, CO2, CH4, etc. was carried out using infrared pulsed lasers.